I bought a bag of baby carrots intending to snack on them at work during the sugar detox, but I just don’t like raw vegetables very much. Almost 3 weeks later, I decided I should really do something to eat those carrots up. Roasting vegetables transforms their flavor from raw to rich and caramelized. 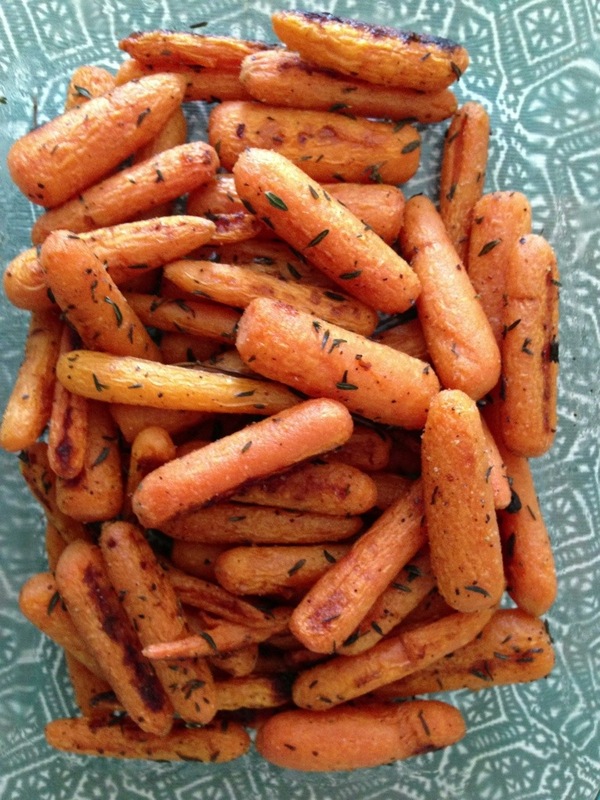 My favorite seasoning to use with carrots is fresh thyme- try this out! 1. Preheat oven to 400 degrees. Toss the carrots with olive oil and spread in a single layer on a baking sheet. Bake for 10 mins. 2. After 10 mins, mix the carrots around and season with the thyme, garlic, salt, and pepper. Continue to bake another 10-15 mins or until tender and golden. Serve these hot as a side dish or cold as a snack. Just made these for my littlest guy, who has a ton of food allergies. He is gobbling them up! Thanks for a great recipe!